The obvious place to start is with is the Lac d’Esparron, a stunning lake of clear, aqua-marine water only a stone’s throw away and not only an extremely pleasant place to swim and have picnics by, but full of possible water sports, from sailing, windsurfing and pedalloing for the energetic (including pedallos with slides, hugely popular with children) to the more sedate self-drive electric boats (motor boats are forbidden) or the guided tour of the lake in the bateau mouche tourist boat, the Perle du Verdon. The beautiful, cave-lined Basses Gorges du Verdon which meander from the lake up to the village of Quinson are not as dramatic as the main Verdon canyon, but extremely pretty nonetheless, and a tranquil place to spend a leisurely afternoon in a canoe or electric boat. 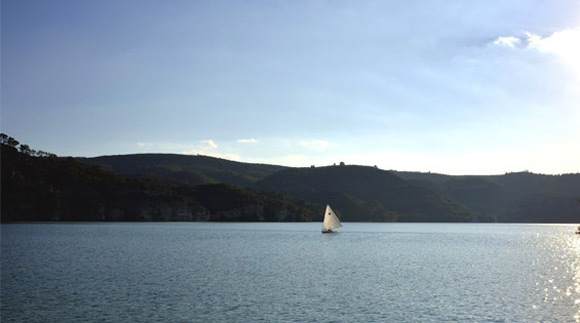 Canoes, pedallos and electric boats, as well as the guided lake cruise, are available from the Perle du Verdon landing, ten minutes’ walk from the house. In the same area you can hire electric boats from Alize Electronic. And a few meters along the shore the sailing club, club nautique, offers week-long sailing and windsurfing courses for children and adults as well as windsurf and canoe hire. You can also find two tennis courts 10 minutes away in the lovely village of Quinson. Reservation at the Office du Tourisme. There are several enjoyable marked walks in the area, the most popular being the sentier decouvert nature trail with an orientation table and superb views. A twenty-minute drive away the wide, turquoise Lac de Sante Croix is also a lovely place for sailing and swimming, or keen sailors could opt for a day or more in an exceptional sailing boat down at the coast. 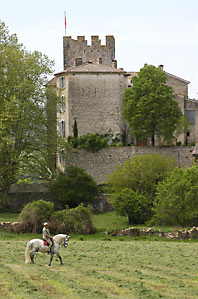 Horse riding (06 87 60 15 97) and bicycles are a good way to explore the area. Parapente, hot air baloons and glider enthusiasts are catered by Aero-Provence. On Tuesdays and Thursdays the damn is opened in the Verdon Canyon making it possible to do rafting kayaking hydrospeed and canyoning. The Verdon is also well-known as a magnet for rock-climbers. Some of the best places are in the Canyon at La Palud sur Verdon, in nearby Quinson, a fifteen minute drive from here and ideal for beginners as well as more advanced climbers, or even in Esparron de Verdon itself. Quinson is also home to the largest pre-history museum in Europe. If climbing is not adventurous enough you can also try bungee-jumping with Latitude Challenge from the Pont de l’Artuby. The Pierrever golf course is 45 minutes away. Children enjoy the tree-climbing adventure park near Gréoux-les-Bains, and the go-kart track in Manosque. In the spa town of Gréoux-les-Bains 20 minutes away, where ‘taking the water’ dates back to Roman times, an afternoon of spa treatments is a pleasant way to unwind.